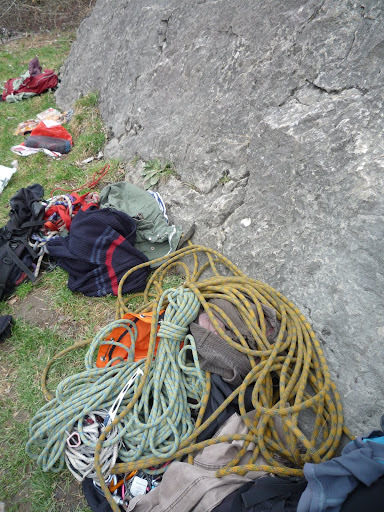 Looking to buy a new pair of Mammut Genesis half ropes? Anyone know who sells them? On the subject, where are people getting good deals on ropes other than Tendons. I got a pair of mammut genesis 70m half ropes from SierraTradingPost though I think it was a one off sale. Ridiculously cheap but same colour. Good ropes though. Try online. From memory Mountain Designs carry Mammut gear. They might be able to get the genesis. I got my set online a while back, from Mountain Tools. I wasn't very happy that the colours advertised online (red/blue) were not the colours that arrived but fortunately my colour blind climbing partner could distinguish them. No go with mountain designs. Bad exchange rates and expensive freight is not looking good from the USA. Why pacifically that rope? Is their somethink expecially good about them? but. But. Engrish where you learn? ed. Just read lots of good reports on the Genesis. Plus i wouldnt buy another Tendon if it was half price. Happy foe other recommendations. The Beal Opera looks good? I have been flogging a tendon master rope for the last month and it held up really well (for a skinny single) Good luck finding a cheap beal opera. They do look nice. I bought a pair of genesis 60m at MD on sale in around 2008 (I think around $150 each) yellow and blue (though many people say they are orange and green). I've taken them all around the world through many conditions; still working fine - though I shaved about 8m off the blue one after spotting some flat patches. If you do find them at a reasonable price please post - I'd be happy to replace mine with a similar set. Well, now that Argos has ordered.. .here it is. cotswoldoutdoors.com for mammut phoenix. go nuts. The Phoenix Classic (i.e. not dry) is half price, but looks like it's only available as an 8.0. You guys just made my day. I had to come back from climbing because my busted toe still won't let me climb on it, was all grumpy and now I have done some shopping therapy. I love mammut ropes and they are hard to find in Oz. $85 each. That is just ridiculous. >now I have done some shopping therapy. >in Oz. $85 each. That is just ridiculous. Std retail mark up of minimum 300% an they flog off superceeded stock at half retail price means they still making a profit. Whats riddiculous is how the gouged general pubics keep coming bak 4 more retail therapy.